A large number of clients are concerned with weight gain or loss and want to start seeing their issue from a higher perspective. Have a successful weight management practice by understanding this topic more fully. 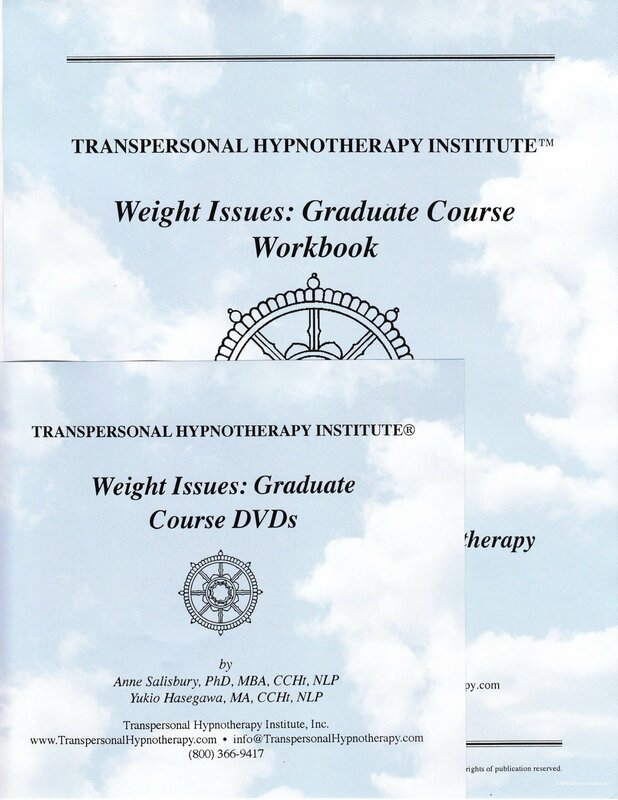 You learned how to interview weight clients in the Transpersonal Hypnotherapy course (for a description see Weight Management Lecture and Demonstration under Hypnotherapy Videos). Now watch one live demonstration session video in which the client’s true essence is accessed (for a description see Weight Management Demonstration under Hypnotherapy Videos). Then in a series of two demonstration session videos learn how to work with eating disorders as the client’s underlying issues unfold over time. The first is taken from Transpersonal Hypnotherapy (Abreaction Reframing Demonstration). The second is only available through this weight course. 15 hours of demonstrations, exercises, readings and practical applications. Up to 6 hours of step-by-step how-to DVDs. A valuable and informative book on weight issues. The “Weight Issues: Graduate Course” certificate of completion suitable for framing. Weight Management: Demonstration (Accessing Essential Aspects through Retrieval Work). Eating Disorders Demonstration #1 (Abreaction Reframing utilizing Ideo-Motor Signals for Weight Issues). Eating Disorders Demonstration #2 (Abreaction Reframing & Breathwork). In the Transpersonal Hypnotherapy course you receive the DVD on Phobias, Weight and Smoking which includes the introductory consultation for weight and the weight demonstration. You may want to review this. Note to Transfer Students: 1) We recommend ordering the individual DVD titled “Weight Management Lecture & Demonstration” when you order this course. 2) Material in this course is also included in the Transpersonal Hypnotherapy Protocols course.